The Life Magazine in which this column runs in The Sunday Monitor had a wedding issue. Weddings aren’t something I’d ordinarily write about but the envelope had to be pushed. This is what I came up with. This wedding issue of Life magazine has left frills and decorative jars strewn all over the place. It’s pretty hard to write in a workspace full of petals so dude, this one’s brief. As you plan your wedding, some quick thoughts. First, you and your fiancé probably haven’t talked about just you in quite a while now. Your past conversations have probably been about one thing or another about the wedding- one review of a to-do list after another. Things are urgent, very urgent and very very urgent. Conflict is there asking you two for a hug. It would be great for you to make time for you two to talk about everything else but the wedding-you are friends after all. Ask her, how is she, that fiancé of yours? Like really, how is she? There are those ‘strange’ counselling sessions – dude, go for them. If you can find somewhere where it’s done by a couple, it would be perfect. It’s best to get both sides of the story. I think you need a man who’s been there to be objective and authentic with you. I believe being a husband to that beautiful lady is one of the highest offices you’ll ever hold – you can’t over-prepare. Pray. You need the good Lord in your corner – it’s trickier trying to do this on your own. Plan your honeymoon, man. After the whirlwind that is preparation, meeting expectations ( and dashing some), tears, arguments, I think you need that time off. Wherever it is that you go, cut the world off completely and focus on just you two. Your house is great but I think it would be ideal to have a few days, even very few, somewhere away. It doesn’t have to be fancy. The change of scenery is good for both of you. You can do the rest of the time at your house. Lastly, enjoy your day, dude. Be deliberate about it. No phones. Have a go-to man or woman for all matters-arising. Food will run out. Chairs will break. The hotel will refuse to serve more drinks. A three-legged chicken will fly in and lay a green egg on the MC’s head. None of that is yours to handle-your go-to person-brother, sister, chairman, whoever- has that covered. The day is yours, enjoy it. Focus on your glorious bride – remind her that she’s doing the right thing. Send her something in the morning – a note, text, flowers, a unicorn. Focus on her. Make sure that she too enjoys her day – fire-fighting isn’t yours, you are the groom after all. This entry was posted in By The Way, Writing on November 24, 2014 by Kakoma. Once upon a time, in a foreign place called Bwaiise, in a time long before the age of swimming pools, people lived wild and free. They ate and drank what nature provided. They skipped and hopped joyfully from one day to another, without a care in the world. Their only question each day was whether to have fruits, vegetables, milk or ask their cattle to take a vote on who should be sent to meet their maker. The cattle always jostled to be eaten because from when they were little skipping calves, they’d been told that when you die, you go to a place where all the grass is green and you don’t have to give anyone your milk. The air was always full of birds chirping; the popular artists in that day were birds actually. Each time you’d walk around, you’d hear a hit chirp from one bird or another. Goldfinch and parakeet were quite big. Even other birds stopped to listen to them belt out their chirps. Everyone kept time to everything. All things were orderly and done at specific times. Fred’s fruits were always available at a certain time. At specific times, Vincent, the-one-who-didn’t-eat-meat, always had plenty of vegetables to go round. The word vegan didn’t exist at the time so Vincent, or Visenti, depending on how heavy your tongue was, was called the-one-who-didn’t-eat-meat to differentiate him from Vincent the butcher. The latter was the one to whom excited cattle was taken to send them to their maker. Life was good and orderly. One day though, all this changed. It seemed like all the other days – skipping and hopping all around. Hi-fives. You’d never suspect that something, actually someone, was going to change this dynamic. Andrew, for that’s a great name for an antagonist, seemed like the most unlikely source of the change. He seemed normal. Punctual. Orderly even. On the fateful day however, he, for no reason in particular, chose to drag his feet and get to Fred’s shop late. Fred, naturally, wasn’t giving fruits anymore. Andrew chose to make a scene. Fred paid him no mind. Hungry, he moved on to Vincent’s, to get some vegetables. Seeing as he’d lost time making a scene, he was late again. He made another scene. Vincent, the-one-who-didn’t-eat-meat, wasn’t having any of that. He promptly cursed Andrew. His children and their children and their children (he said this quite a number of times) would be at the mercy of wayward engine-propelled means of transportation for many generations. Andrew thought nothing of it. He went on to father all of us. And that’s how Boda Bodas came to be; they are karma’s way of getting back at us for poor time-keeping. This entry was posted in By The Way, Writing on November 17, 2014 by Kakoma. Many people have scoffed at the mundane-looking hand-held security gadget used to search them as they enter a building. “This rugged device doesn’t do anything. It just beeps for nothing “, they say. I shared the same sentiments till I had a chance meeting with a top security official who used a promise of grievous harm to remain anonymous. He, in hushed tones, let me in on the gadget’s secrets. “The real reason security personnel don’t do much to check you as you enter a building is because of how powerful this device is,” he said, pointing at the gadget. “It isn’t because they are lazy, incompetent or both. I tell you young man, (now assuming an air of importance), the probrem (sic) with young men these days is they don’t respect anything that’s not connected to the internet.” I nod sagely to spur him on. “When the security man uses it on you, with one wave, it’s recorded everything we need to know, even your tribe.” I think of leaving now but he has a weapon and he’s still talking. “It tells us whether you’ve tried to disembark without paying for a taxi ride. It shows whether you drunk your buddy’s beer when he wasn’t looking. We can tell the average time you go to bed. We know whether you start arguments for no reason.” He sips his drink. “You people of books that’s your probrem (sic), always with many questions. Now what kind of question is that?” I shift in my seat, waiting for a distraction so I can sneak off. He seems to wait with me. This entry was posted in By The Way, Writing on November 10, 2014 by Kakoma. A job ad run in a leading daily sometime last week for an administrative assistant in what, on the surface, seemed like a blue chip company. 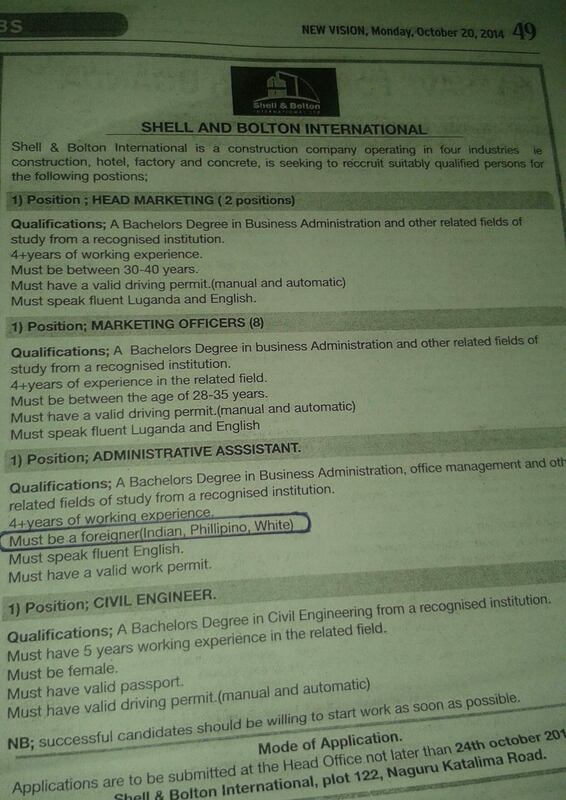 The company though required that before you apply, you “must be a foreigner (Indian, Phillipino, White)”. All those reading the ad and considering applying stopped at that part and wondered why, all those years ago, they’d laughed at the thought of bleaching; if they’d started then, they’d be white by now. Oh well, there goes a perfect opportunity to be the assistant you’ve always wanted to be all because you thought there was nothing wrong with your skin colour. “We also stated that the candidate should have over four years of working experience. Now, let’s be honest, which black Ugandan has that much experience?” I made a move to answer but he cut me off and continued. “Before you answer, remember that with a black Ugandan worker, you have to factor in the time he’s off to the village to bury someone, then the time he’s away “sick”, then, and this is the most important, all those times he’s out “chasing a deal” and then, this is even more important, the times he’s at his desk but isn’t working. The talk did get heated after that and I failed to document the rest. One fine day though, we’ll be judged on our competence. This entry was posted in By The Way, Writing on November 3, 2014 by Kakoma.